Satellite Radio, Onboard Communications System, Keyless Start, TRANSMISSION, 6-SPEED AUTOMATIC, ENGINE, 1.5L TURBO DOHC 4-CYLINDER DI... LT trim, CAJUN RED TINTCOAT exterior and JET BLACK interior. EPA 36 MPG Hwy/27 MPG City! CLICK NOW!======KEY FEATURES INCLUDE: Back-Up Camera, Satellite Radio, Onboard Communications System, Keyless Start Keyless Entry, Steering Wheel Controls, Child Safety Locks, Alarm, Electronic Stability Control. 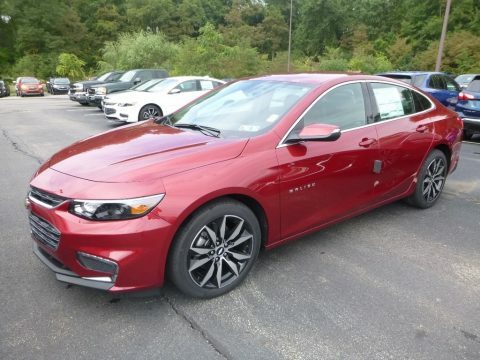 ======OPTION PACKAGES: CONVENIENCE AND TECHNOLOGY PACKAGE includes (BTV) remote vehicle starter system, (DD8) inside rearview auto-dimming mirror, (KI6) 120-volt power outlet, (UDD) color Driver information Center, (IO5) Chevrolet MyLink Radio, (K4C) Wireless Charging, (USS) dual USB charging-only ports in rear of center console, (N34) leather-wrapped steering wheel and (VY7) leather-wrapped shift knob Also includes (PZX) 18" aluminum wheels and (R0X) 245/45R18 all-season, blackwall tires. ), AUDIO SYSTEM, CHEVROLET MYLINK RADIO WITH 8" DIAGONAL COLOR TOUCH-SCREEN, AM/FM STEREO with seek-and-scan and digital clock, includes Bluetooth streaming audio for music and select phones; voice-activated technology for radio and phone; featuring Android Auto and Apple CarPlay capability for compatible phone, TRANSMISSION, 6-SPEED AUTOMATIC (STD), ENGINE, 1.5L TURBO DOHC 4-CYLINDER DI with Variable Valve Timing (VVT) (160 hp [119.3 kW] @ 5700 rpm, 184 lb-ft torque [248.4 N-m] @ 2500-3000 rpm) (STD). Chevrolet LT with CAJUN RED TINTCOAT exterior and JET BLACK interior features a 4 Cylinder Engine with 160 HP at 5700 RPM*. ======EXPERTS ARE SAYING: "Our non-hybrid test car stopped from 60 mph in 113 feet â€” excellent for a car in this class. Confident-feeling hybrid brakes are the best in the segment Great Gas Mileage: 36 MPG Hwy. Horsepower calculations based on trim engine configuration. Fuel economy calculations based on original manufacturer data for trim engine configuration. Please confirm the accuracy of the included equipment by calling us prior to purchase.